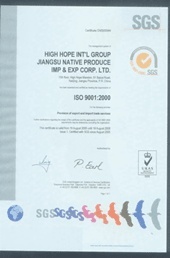 HIGH HOPE INT’L GROUP JIANGSU NATIVE PRODUCE IMP & EXP CORP. LTD. was founded in 1973. Our company produces aromatic chemicals, synthetic and natural Fragrances, Pharmaceutical Intermediates and Botanical Extracts. Currently there are over 200 varieties of aroma chemicals and natural products, which are the categories of Esters, Acids, Alcohols, Aldehydes and Essential oils. The quality of our products is up to the international FCC standard. Now our hot products are:2-Undecanone(CAS No. :112-12-9), Iso E Super(CAS No. :54464-57-2), Methyl cedryl ketone (CAS No. :32388-55-9), Methyl Phenylacetate(CAS No. :101-41-7), Ethyl Phenylacetate(CAS No. :101-97-3),N-Propyl Bromide(CAS No. :106-94-5), Carvacrol(CAS No. : 499-75-2), Cedarwood oil(CAS No. :8000-27-9), Clary Sage Oil(CAS No. :8016-63-5) etc. We also provide Cedarwood oil, Clary Sage Oil, N-Propyl Bromide, Methyl Cedryl Ether, 4-Methyl guaiacol, Propenyl Guaethol, Carvacrol, etc.